Today is the 13th day of September -- 10 years after an important milestone for the United States and the West. Ten years ago our way of life and our freedoms, our liberal democracy and our rule of law were all assaulted and violated. No, it didn't take place in New York or Washington. It took place at a small family-run petrol station in Mesa, Arizona. A young man named Balbir Singh Sodhi, sporting a smartly kept beard and a turban, was shot dead. He was planting flowers in the garden of his family business. But why mention his beard and turban? Was this at all relevant to Sodhi's murder? When the planes first crashed into the World Trade Centre and the Pentagon, men sporting turbans and beards were all suspected of some kind of involvement. The first pictures released by the FBI of suspected terrorist passengers included men sporting beards and turbans. Even Sydney's Daily Telegraph carried a front page showing a man, his head bowed, sporting a small beard and a blue turban, being taken into custody. The headline screamed "FIRST ARREST". Turbans and beards were now the symbol of terror. Why? Because Obam ... whoops ... Osama bin Ladin wore a turban. Roque was convicted of killing Sodhi, a Mesa gas station owner whom prosecutors said was targeted because Roque thought Sodhi was Arab. Sodhi wore a turban and beard as part of his Sikh faith. According to an AAP report about Roque's sentencing in 2003, after shooting Sodhi, Roque shot at another gas station where the clerk was a man of Lebanese descent, and shot at the home of an Afghan family. They were not injured. ... an eclectic Sikh temple called Gobind Sadan was burnt down by four teenagers who thought that the turbaned worshippers were Muslims and that the temple's sign said 'Go Bin Laden'. 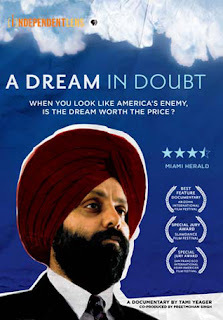 Sikhs, like other minorities, have suffered a disproportionate amount of prejudice since 9/11. They have stood out due to their visible religious devotions including wearing the dastaar, a traditional Punjabi-style head dress. Until recently, Sikhs had to remove their turbans when flying. Sikhs also have their turbans frisked at airport security, a ridiculous and humiliating practice. Paranoia about turbans has become so great that they even became an issue in the US Presidential elections when a picture of Obama wearing traditional clothes of Somali elders was leaked by opponents. September 11 was the day when tragedy struck the US and when men and women of all nationalities and faiths were murdered by crazed fanatics. But 9/13 is the day when minorities of all nationalities and faiths started becoming subjected to abuse and denial of liberty in the name of protecting us from terrorists who wish to abuse our way of life and deny us liberty. It isn't just about airport searches. Men from certain minorities have been detained more readily and for longer periods of time. Paranoia was even present in the aftermath of hurricane Katrina, when immigrants such as painting contractor Abdurrahman Zeitoun were detained and treated like terror suspects. The war on terror hasn't just led to imbecilic wars that have killed hundreds of thousands of innocents. It has created a scud missile mentality where at home our collective hatred is hardly ever directed at the right people. Just ask the Sodhi family. First published in Crikey on 13 September 2011.